We have all heard that breakfast is the most important meal of the day, but do we know why? Starting off the day with a healthy breakfast helps you to meet your daily nutrient requirements, have better concentration and productivity throughout the morning, and have lower cholesterol. This recipe hits three out of the four basics of a healthy breakfast, according to Mayo Clinic. It has whole grains, low-fat dairy, and fruit. Place oven rack in the top third of the oven. Preheat the oven to 400 degrees F. Line muffin tins with 18 paper baking cups. In a large mixing bowl, combine the flours, baking powder, baking soda, salt and orange zest. Add the fresh blueberries and toss gently to coat the blueberries in flour. This will help keep the blueberries suspended in the batter versus falling to the bottom. In a medium mixing bowl, lightly beat the eggs, then whisk in the buttermilk, brown sugar, canola oil, orange juice and vanilla. Don’t be concerned if the mixture looks curdled or lumpy. Pour the wet ingredients into the dry ingredients and stir until most of the flour is incorporated. The mixture will be slightly lumpy; don’t over mix. Divide the batter among the 18 prepared muffin cups. Share a photo of your muffins with Twitter and Instagram. 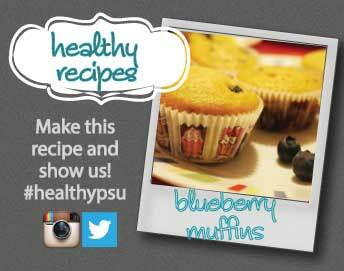 Make sure to tag #healthypsu and your picture could be shown on our blog!